I cannot pick up my bib on March 6 or 7. Is there another opportunity to get it? You can pick up your race bib on the morning of the event between 7-8 am. Parking is free; we recommend parking in the Drollinger Parking Lot, which is closest to the event. 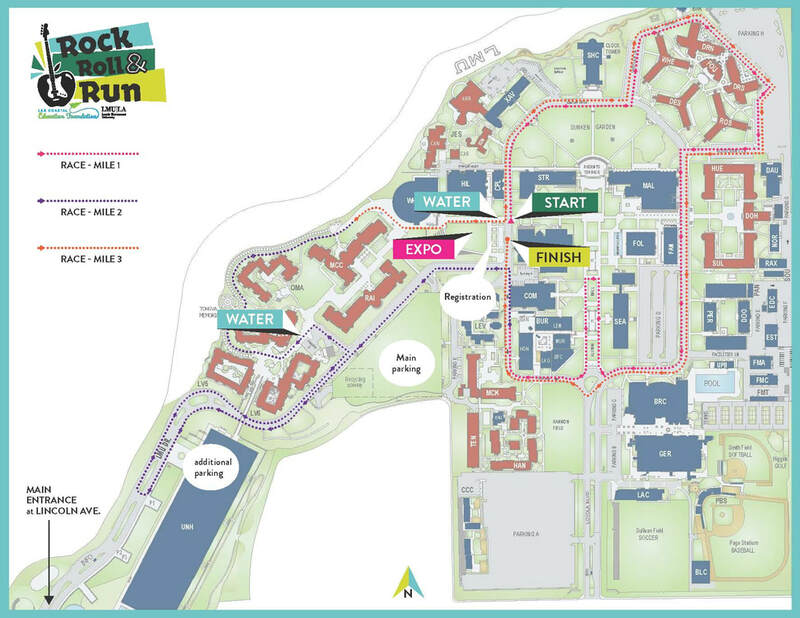 If driving, please arrive at LMU by 7:30 am due to street closures for the race. After 7:45 am, you will be unable to park at the LMU Drollinger lot. Alternative parking will be located at University Hall P2/P3 (it will take about 10-15 min. to walk uphill to the event). You must enter LMU through Lincoln, and signs will direct you up the hill to parking. Can people sign up on race day? Yes, people can register the day of the event and at packet pick up on March 6 and March 7 (9100 S. Sepulveda Blvd., Ste. 208, Los Angeles, CA 90045). If you would like to make sure that the money from your registration goes to a specific school, make sure to drop off your bib after the race (at the designated drop off location) with the schools name on the back. We will allow signups until all of our bibs run out. Please leave bikes, scooters, wheelies, roller skates etc. at home as they will not be allowed on the course. While we love our four-legged friends, pets are not allowed on campus. Many of our vendors will be passing out snacks, protein bars, coffee, popcorn and other snacks starting at 8 a.m. Yes, costumes are encouraged! Since this event is called the Rock Roll and Run, we are STRONGLY encouraging people to come in costumes—especially those related to music / rock & roll! An award will be given to the school with the best costumes. When do the prices for the 5k & 1k go up and if so, by how much and by which date? Prices will go up by $5 in person registration (3/6, 3/7 and 3/9) for the category of adult 5K, 12&under 5K and 1K event. February 25 will be the last day to register online. After that, day of race registration will be available in person at packet pick up or on race day. However the funds will be not be directed at the school and will go in the foundation's grant funds available only to all foundation schools. How often will we volunteer leads be notified regarding number of sign-ups? Can we bring schools bring sponsors? This year we are not asking that schools bring in sponsors. Based on feedback from our sponsors last year, we made this decision. We are hoping that our schools can focus on getting runners both real and virtual. When can I pick up my race bib? March 6 and 7 from 4-7PM at the Chamber of Commerce located at 9100 S. Sepulveda Blvd., Ste 208, Los Angeles, CA 90045. You can also pick up your bib race morning from 7 - 8 am. Is each school required to provide 5 volunteers to help with the race? Yes. Volunteers positions will be needed on March 6, 7 and 9. If you have volunteers that joined us last year and enjoyed and were good at their jobs we welcome them to return to those positions. All new volunteers are also welcome. Please help us best suit the volunteers talents to the jobs available. Remember that volunteers on the day of the race cannot run the race unless they are scheduled for clean-up only. Yes. strollers will be allowed in the 5K at a staggered start – behind the runners. In the 1K we ask that the strollers start in the last wave of runners (we will have at least three starts for the 1K – based on age). Can schools get their own booths? Schools can purchase a booth ($500). The money from booth sales will be treated like an event sponsor and will NOT go back to the schools, except in the form of grants. We are monitoring the weather very closely and are hoping for clear skies. However, the event will happen rain or shine. In case of extreme rain, we will move the Expo portion of the event inside. Can I run with my child in the 1K race? Yes. If you have a bib from the 5K race, please keep it on for the 1K race. If you do not have a bib, you will need to sign a liability waiver at the race. We will have a table set up near the start of the race to sign the forms. You will then be given a sticker to wear on your shirt. Any parents that would like to run with their kids will be asked to line up in the third wave of 1K runners. How does the 1K work? The waves will be launched in about thirty-second increments. Although there are no awards for fastest 1K runner, each runner will be timed as soon as they start the race. 1K runners will receive a gift certificate for a free meal at Tony P’s Dockside Grill. Will I receive anything when I sign up? Yes, but only while supplies last. 1,250 towel will be handed out during packet pickup/race day. Please be aware we will run out. No. Unfortunately, we don’t have any areas to check bags. No. Your registration is non-refundable and race proceeds will go towards the 18 participating schools and the Education Foundation. Will there be photos from the event? Yes. RaceWire and Zsuzi Photography will be taking photos of the event. We will post photos online after the event. The HomeTown News will publish photos in their April edition as an event recap. Will there be a discount online if you sign up multiple runners? There will be no discounts for inperson registration. I didn’t register online. Is there still time? You can register at packet pick up on March 6 and March 7 from 3-7 pm at the Chamber office (9100 S. Sepulveda Blvd., Ste. 208, Los Angeles, CA 90045) or at the event on race day (Saturday, March 9). We will accept signups until we run out of bibs. Additional questions? Please email info@laxcoastaledfoundation.com or (310) 645-5151.